MGC today announce the full casting for Michael Grandage’s production of Martin McDonagh’s The Lieutenant of Inishmore which opens at the Noël Coward Theatre on 4th July, with previews from 23rd June and runs until 8th September. Joining Aidan Turner (Padraic) completing the all Irish cast are Denis Conway (Donny), Will Irvine (Christy), Brian Martin (James), Daryl McCormack (Brendan) Julian Moore-Cook (Joey), Charlie Murphy (Mairead), and Chris Walley (Davey). 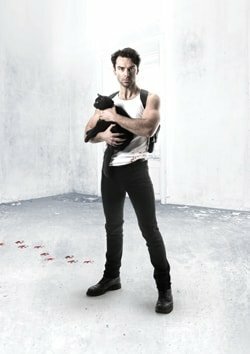 The Lieutenant of Inishmore joins Grandage’s production of John Logan’s Red with Alfred Molina and Alfred Enoch in the West End. Red opens at the Wyndham’s Theatre on 15 May, with previews from 4 May, and runs until 28 July. The plays have over 40,000 seats at just £10 – 25% of the total capacity, continuing the company’s unique access policy and its commitment to developing new audiences. Who knocked Mad Padraic’s cat over on a lonely road on the island of Inishmore and was it an accident? He’ll want to know when he gets back from a stint of torture and chip-shop bombing in Northern Ireland: he loves that cat more than life itself. Martin McDonagh is an award-winning writer and director. His plays are The Beauty Queen of Leenane, A Skull in Connemara, The Lonesome West, The Lieutenant of Inishmore, The Cripple of Inishmaan, The Pillowman, A Behanding in Spokane, Hangmen and the upcoming A Very Very Very Dark Matter. As a writer and director for film his credits are Seven Psychopaths, In Bruges, Six Shooter as well as Three Billboards Outside Ebbing, Missouri – which won four Golden Globes including Best Drama Motion Picture and Best Screenplay of a Motion Picture, and Best Screenplay at the Venice Film Festival, the Grolsch People’s Choice Award at the Toronto Film Festival and was the closing film at this year’s BFI London Film Festival. Denis Conway plays Donny. His theatre work includes The Death of Harry Leon, Myrmidons, Making History (Ouroboros Theatre Company), Wallenstein (Chichester Festival Theatre), The Walworth Farce (Druid Theatre and National Theatre), and Homelands, The Recruiting Officer, A Cry from Heaven and The Wild Duck (Abbey Theatre, Dublin). His television work includes Single Handed, The Running Mate, Hide and Seek, Showbands, The Clinic and The Return; and for film, Garage, The Wind that Shakes the Barley, Tiger’s Tail, Alexander the Great, Borstal Boy and Michael Collins. Will Irvine plays Christy. His recent theatre work includes End Of (Dublin Fringe), Lady Chatterley’s Lover (ETT), Inkheart, Angel Meadow (Home), The Nether (Royal Court Theatre & Headlong) and Pentecost (Lyric Theatre Belfast). His television work includes Will, Centenary, Legends, Charlie, Vikings, Titanic: Blood and Steel, The Clinic and The Tudors; and for film, Dublin Old School, Born a King, The Current War, Maze and The Alarms. Brian Martin plays James. For Shakespeare’s Globe his work includes Boudica, The Merchant of Venice (also national and international tour), Sunday Sonnets and Titus Andronicus. His other theatre work includes Snapshot (Hope Theatre), Damned by Despair, Juno and the Paycock (National Theatre), Stars in the Morning Sky (Belgrade Theatre Coventry) and The Wake and Macbeth (Abbey Theatre). Daryl McCormack plays Brendan. His theatre work includes The Voice Factor X (New Dublin Theatre), Enjoy (Rough Magic), Othello (Theatre Royal), Romeo and Juliet (Gate Theatre Dublin) and The Grapes of Wrath (Project Arts Centre). For television, his work includes A Very English Scandal, Immortality, Dawn, Fair City and Vikings; and for film, A Good Woman is Hard to Find and The Randomer. Julian Moore-Cook plays Joey. His theatre work includes Mother Courage and Her Children (Southwark Playhouse), Three Sisters (Lyric Theatre Belfast), Rolling Stone (Orange Tree Theatre), Twelfth Night (Iris Theatre), Obamamerica (Theatre503), Our American Cousin (Finborough Theatre) and Beyond Caring (The Yard Theatre). His television work includes Benidorm (as series regular Callum) and 24: Die Another Day; and for film, Mission Impossible 5. Charlie Murphy plays Mairead. Her theatre work includes Arlington (St Ann’s Warehouse and Galway International Arts Festival), Big Maggie (Druid Theatre), Disco Pigs (Young Vic), Pygmalion (National Theatre of Ireland – Best Actress Irish Times Theatre Award), The Silver Tassie (Druid Theatre and Lincoln Center) and The Colleen Bawn and This is Our Youth (Bedrock Theatre). For television, her work includes Peaky Blinders, Happy Valley, Rebellion, To Walk Invisible, The Last Kingdom, The Village, Quirke, Ripper Street, Misfits and Love/Hate for which she twice won the Best Actress Award at the Irish Film and Television Awards; and for film, Dark Lies the Island, The Foreigner, ’71, Northmen – A Viking Saga and Philomena. Aidan Turner plays Padraic. His theatre work includes The Plough and The Stars, Romeo and Juliet and A Cry from Heaven (Abbey Theatre Dublin), Cyrano and Titus Andronicus (Project Arts Centre). For television, his work includes The Clinic, Being Human, Desperate Romantics, Hattie and as the title role in Poldark, now in its 4th series; and for film, The Hobbit trilogy of films, The Mortal Instruments, The Secret Scripture, Loving Vincent and the forthcoming Look Away and The Man Who Killed Hitler and then the Bigfoot. He was named GQ Actor of the Year for 2016 and Radio Times’s Most Popular UK Actor in 2015, 2016 and 2017. Chris Walley plays Davey. This production marks Walley’s professional stage debut, following training at RADA. His film work includes The Young Offenders. Michael Grandage is Artistic Director of the Michael Grandage Company in London. For the company he directed Photograph 51, Dawn French: 30 Million Minutes, Henry V, A Midsummer Night’s Dream, The Cripple of Inishmaan, Peter and Alice and Privates on Parade, and the feature film Genius. He was Artistic Director of the Donmar Warehouse (2002–2012) and Artistic Director of Sheffield Theatres (2000–05). He is the recipient of Tony, Drama Desk, Olivier, Evening Standard, Critics’ Circle and South Bank Awards. He has been awarded Honorary Doctorates by the University of London, Sheffield University and Sheffield Hallam University and is President of Central School of Speech and Drama. He was appointed CBE in the Queen’s Birthday Honours 2011. His book, A Decade At The Donmar, was published by Constable & Robins in 2012. His work for the Donmar Warehouse includes directing Eddie Redmayne in Richard II, Felicity Jones in Luise Miller, Derek Jacobi in King Lear, Red (also New York, Tony and Drama Desk Awards Best Director), Jude Law in Hamlet (also Elsinore and New York), Ivanov (Evening Standard and Critics Circle Award Best Director), Madame de Sade, Twelfth Night, The Chalk Garden (Evening Standard and Critics Circle Awards Best Director), Don Juan in Soho, Frost/Nixon (also Gielgud, New York, USA tour, Tony Nomination Award for Best Director), Othello (Evening Standard and Critics’ Circle Awards for Best Director), The Wild Duck (Critics Circle Award Best Director), Guys and Dolls (Olivier Award for Outstanding Musical Production), Grand Hotel (Olivier Award for Outstanding Musical Production and Evening Standard Award Best Director), The Cut, After Miss Julie, Caligula (Olivier Award Best Director), Merrily We Roll Along (Evening Standard Award Best Director), Passion Play (Evening Standard Award and Critics Circle Award for Best Director). For Sheffield Theatres he directed many productions including Don Carlos (Evening Standard Award Best Director). He most recently directed Disney’s Frozen at Buell Theatre, Denver, ahead of opening on Broadway in the Spring. MGC is a london based production company that produces work across all media, nationally and internationally. The company has also established a general management service and looks after a select group of creative practitioners. Since launching in 2012 their work includes Privates on Parade with Simon Russell Beale, Peter and Alice with Judi Dench and Ben Whishaw, The Cripple of Inishmaan with Daniel Radcliffe, A Midsummer Night’s Dream with Sheridan Smith and David Walliams and Henry V with Jude Law as part of a year long season at the Noël Coward Theatre, Dawn French: 30 Million Minutes (national and international tour and West End), The Dazzle with Andrew Scott (Found111), Photograph 51 with Nicole Kidman (Noël Coward Theatre), Hughie with Forest Whitaker (Broadway) and Labour of Love with Martin Freeman and Tamsin Greig (Noël Coward Theatre); and the feature film Genius with Colin Firth, Jude Law and Nicole Kidman.